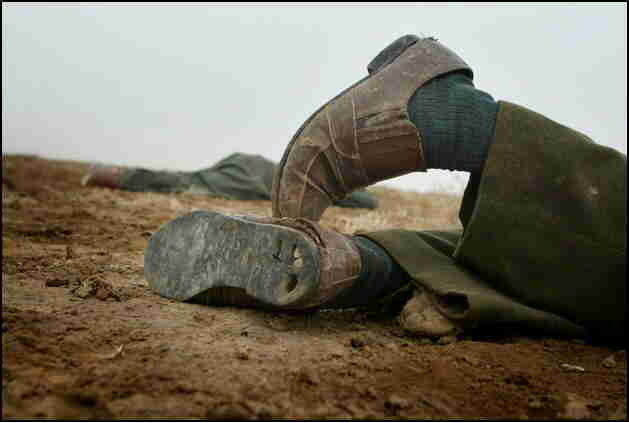 Caption: Shoes on the body of an Iraqi soldier killed as Army troops advanced north through Iraq tell a story about a poorly equipped army. Almost all of the Iraqi dead -- more than eight in one location -- were wearing worn-out civilian-style shoes. (Photo: David Leeson / Dallas Morning News / Corbis). I was very struck by this photo of a dead Iraqi soldier when I first came across it a couple of days ago. Of course it is because of the shoes. They look like the dress shoes that my Dad used to wear. And they turn a picture of an Iraqi soldier into a picture of an Iraqi who was someone's father, or brother, or uncle or husband or son. I don't suppose his children have seen this photo. I wonder if they even know he is dead, or if they are still hoping that somehow in the chaos of occupied Iraq he might still one day emerge from Abu Ghraib? 6. They didn't have long-range UAV's. 7. They didn't have boots. The Iraqis, who were supposed to be an imminent threat to the most powerful nation on the face of the earth, didn't even have boots. Very good post. And very sad. We kill the poorest of the poor, and call them evil. For what? For Wal-Mart, where we can get cheap shoes.